Circumcision a Uniting Factor - Israel might forget many things as a people, but God would not permit the "chosen ones" to forget that they had entered into a covenant with him. If Israel did have a lapse of memory concerning its place in the plan for blessing, there was always that mark on the flesh to refresh memory. Separation a Uniting Factor - Away from the beck and call of the polytheists in Ur, the chosen ones of God came within hearing distance of "The Eternal Voice." The pagan impressions, which the covenanters brought with them from the environs of Ur, soon began to crumble in the face of that voice. United by Dreams - Israel's tomorrows were filled with splendid things: a land to be possessed, descendants as numerous as the stars, a kingdom to inherit, and a place in the sun which would permit these people to be a blessing to the whole world. No people could contemplate such lofty thoughts without being united in the process. United by Oppression - Some of the things which Israel experienced in the progression from tribal clan to mighty nation were difficult and heavy to bear. God often blessed the chosen ones in and through their most bitter hours. Israel was united by oppression so that a destiny might not be lost. United by the Law Received at Sinai - The possession of a law so unique, so majestic, and so authoriative, and the dramatic evidence that God was faithful to the promises of old, united Israel in a powerful way! The Prism Symbol - Unified by circumcision, by separation, by dreams, by oppression, and by the possession of a unique law, Israel moved forward toward the realization of the destiny, "to be a blessing." Mortar bowls and pestles - Israel was united into a people in pursuit of common purpose by specific historical experiences. Pestle with sharp rock symbol - The rite of circumcision. Pestle with blue ring - Separation symbol for ethnic, within family, and geographic separation. Pestle with land scene and throne - Israel's common hopes and dreams for a meaningful future. Pestle with law symbol - The law received at Mt. Sinai. 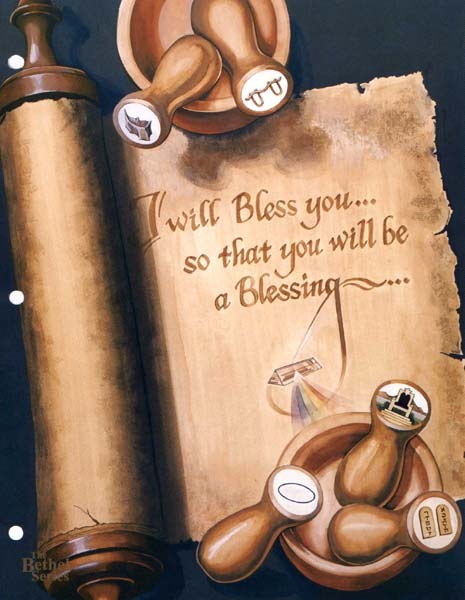 Prism symbol on manuscript - Unified, Israel moved forward toward the realization of its destiny "to be a blessing."